In case you haven’t heard, Beyoncé dropped a surprise new song, “Formation,” and music video yesterday, and of course, the Internet went nuts. I’ve personally watched the video about 26 times already and I’m hooked! There’s so much to digest, her style, her hair, the imagery, the message, Blue Ivy‘s cuteness, the lyrics, the dance moves, and so on and so on. Already, a million thinkpieces, personal thoughts, and reviews of the song/video combo have been written and published online so let Google help you take your pick. My favorite piece is Awesomely Luvvie‘s breakdown of the song and video. It’s an awesomely funny read. Anyway, while we’re all talking about, loving, and hating “Formation,” Beyoncé is cashing in on her new song. 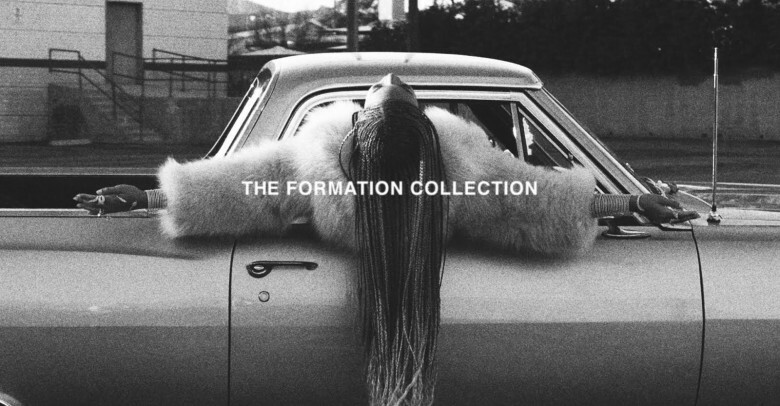 And here’s another way: she’s already launched a collection of “Formation” merchandise on her website, Beyoncé.com. The line of apparel and accessories features, what else? Lyrics from her new hit song. There you can buy conversational pieces like a T-shirt featuring a photo of Queen Bey with the word “Slay” ($35), a sweatshirt ($60) with the caption “I Twirl on Them Haters,” a “Hot Sauce” baseball cap ‘picante dad hat’ ($36), a tote bag ($25) that reads “I Got Hot Sauce In My Bag,” and an iPhone case ($25) emblazoned with “You That B*tch When You Cause All Of This Conversation.” Oh. What do you think of Beyoncé‘s new song, music video and merchandise? What will you be buying?